For freshman Tim Carrico, having Russ Buettner guest lecture in his �Future of Journalism� class was inspiring. Buettner specializes in investigative and computer-assisted reporting for the New York Times. He came to Scripps to talk to students about his career and his recent series, �Abused and Used.� The series, written with Danny Hakim, investigated deadly flaws in the state of New York�s system for caring for the developmentally disabled. The series won the Ursula and Gilbert Farfel Prize for Excellence in Investigative Reporting and was a finalist for the Pulitzer Prize. Buettner said he learned of the story because of a father who fought for change after his son died. Sandhya Kambhampati, the OU SPJ President, met one-on-one with Russ to get his advice about a computer-assisted reporting story she is working. 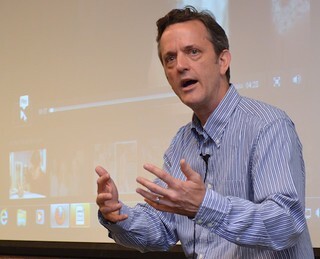 Buettner said investigative work can be difficult and requires a �constant, harsh evaluation of where you are.� He also encouraged future journalists to learn multimedia skills. Going forward, journalists must combine the historical strengths of institutions like the New York Times and new media, according to Buettner. When asked what motivates him as a journalist, Buettner said he wants some good will come out of his work. �One of the great things about journalism is that you live close to the bone of life, encountering things you�d never encounter otherwise,� he said. That message resonated with freshman Allison O�Brien, who has a cousin with severe Down syndrome.